Astronomer Robert H. Baker (1880-1962) once wrote of the Great Hunter or Celestial Warrior, Orion, that he shines "like a gigantic piece of celestial jewelry through the frosty winter air." Indeed, Orion is by far the most brilliant of the constellations and is visible from every inhabited part of the Earth. As darkness descends, he clearly dominates the southeast sky. 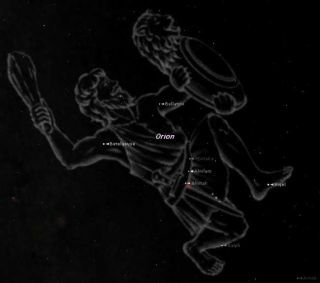 Three bright stars in line in the middle of a bright rectangle decorate Orion's belt, which point northward to the clusters of the Hyades and Pleiades of Taurus, and southward to the Dog Star Sirius. Rigel (the "Left Leg of the Giant"), is a blue-white supergiant star, one of the rarest breeds in our galaxy; it's one of the most intrinsically luminous of all stars and one of the hottest, apparently just reaching the prime of its life in the time span of a star and literally "burning the candle at both ends." It has been computed that Rigel's luminosity is something like 36,000 times that of the sun. Our best estimates currently place it at 773 light-years away. In contrast, red supergiants like Betelgeuse ("The Armpit of the Giant") are gigantic bloated globes of cooler gas. If such a star were to replace the sun in the solar system, it might extend beyond Mars' orbit. Betelegeuse is near the end of its career, some 522 light-years away, but not shining with a steady light. It is a "pulsating" star, expanding and contracting spasmodically with a diameter that varies from 550 to 920 times that of the sun, but so irregular are these pulsations that no one can predict exactly when it will expand or contract. In trying to describe Betelegeuse many years ago, a lecturer at New York's Hayden Planetarium noted that it is "like an old man with his strength almost entirely spent, panting in the asthmatic decrepitude of old age." This is what Rigel will become in a few million years. In such stars, the core produces successively heavier elements to balance the incessant crush of gravity. But once the core begins creating iron, a star's days are numbered; the formation of elements heavier than iron consumes rather than produces energy. Eventually, since the core can no longer support the star's vast weight it collapses, triggering a cataclysmic supernova explosion. Betelgeuse is in its final stage and could explode in only a few million years.